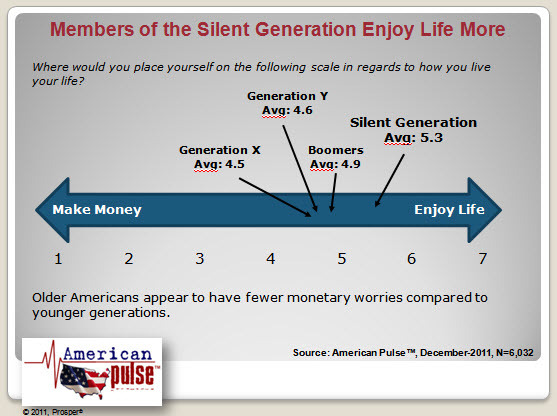 Home > American Pulse, Consumer Behavior & Trends, Economy	> Pursuit of Happiness? Or Quest for Cash? Pursuit of Happiness? Or Quest for Cash? Members of the Silent Generation appear to be sitting pretty—either already retired or poised to be so soon. 93.5% of them would rather spend time with family than spend time making money and 87.3% would like to spend time with friends (12.7% would choose a new technology device over their friends!) At this time in their lives, the majority of the Silent Generation would also like to have a full life (87.6%) rather than a full bank account (12.4%). On the other side of the generation spectrum, members of Generation Y seem to be divided. Half of them appear to be doing well financially (either living with parents or gettin’ paper like Chris Brown) while the other half is struggling to make ends meet. Almost half (43.6%) would choose a job that pays well over one they truly enjoy. This compares to only a third (34.2%) of all Americans who would trade job satisfaction for a bigger paycheck. There are times when I agree with these struggling Gen Yers (a girl’s gotta eat! ), but lucky for me, I have a fulfilling job that also pays the bills. Good (and surprising to some) news, friends still trump tech toys for members of Gen Y! 76.8% of Gen Y would rather hang with friends than twitter around with a new smartphone or tablet (23.2%). Although my smartphone is addicting, I agree with the majority here—friends make my life more enjoyable than my smartphone (although Words with Friends combines the best of both worlds). Where do you stand on the scale from “Make Money” to “Enjoy Life”? How do you find ways to pursue happiness in a tough economy? We love to hear from you!